Lusty groupies, ample drug intake, smoky hallways and deafening rock music. One might have thought last night’s ‘Mad Men’ — partially centered around the backstage antics of a Rolling Stones concert — was taking place at Shea Stadium, where the Beatles famously performed to their largest audience in 1965. Or maybe that was Madison Square Garden, the one on Eighth Avenue and 50nd Street, where Marilyn Monroe sang happy birthday to John F. Kennedy in 1962? 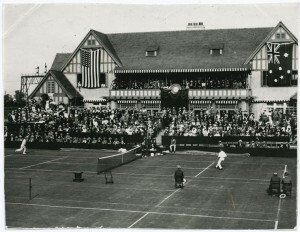 No, that mad, bacchanalian event took place at an esteemed tennis club — the West Side Tennis Club in Forest Hills, Queens. 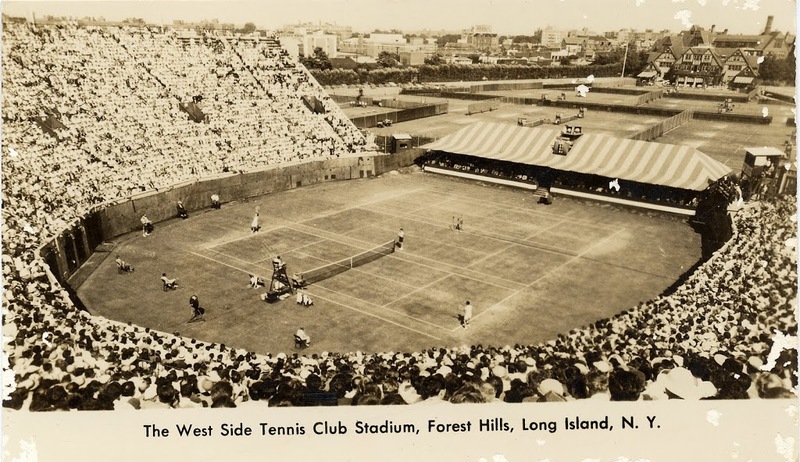 Organized in New York in the 1890s, the tennis organization and social club quickly outgrew various venues in Manhattan and made their way to Queens. 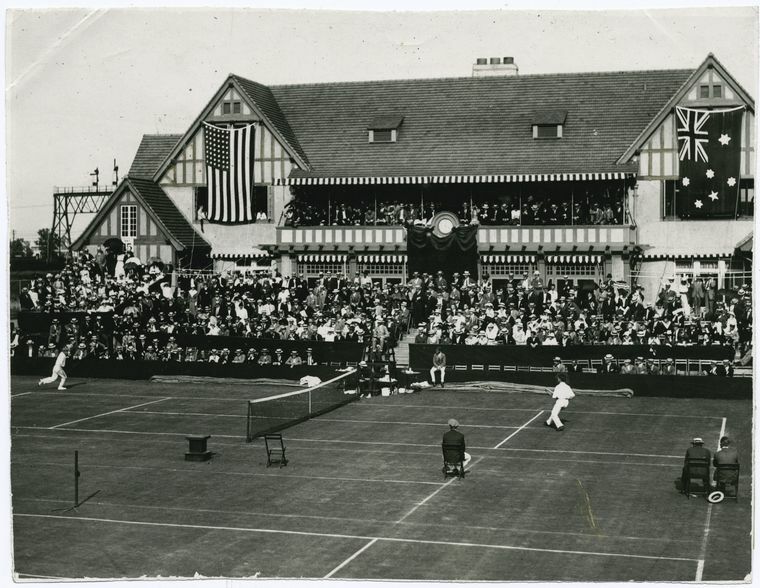 The momentary inconvenience of relocating to an outer borough was swiftly forgotten when the venue opened in 1914, a sumptuous series of grand courts, manicured lawns and a spectacular Tudor-style clubhouse designed by Grosvenor Atterbury* and John Almay Tompkins. A later court addition would provide seating for 14,000 spectators. The clubhouse reflected the style of homes in nearby Forest Hills Gardens, also planned by Atterbury as a private, upper class community. To this day, the ‘cottage community’ is one of Queens most exclusive neighborhoods. The grounds were so abundant that it drew the U.S. Open from Newport, Rhode Island, in 1915, and they remained here until 1987. In fact, for most of the 20th century, the tennis club became the American capital for the sport, seeing victories by sports icons like Arthur Ashe, Jimmy Connors, Althea Gibson and Billie Jean King. Alfred Hitchcock even filmed a pivotal scene in ‘Strangers On A Train’ here. Tying in some of these themes of this season of ‘Mad Men’, there was even a scandal involving the exclusion of black and Jewish members from the club in the 1959, a scandal that involved an under-secretary from the United Nations. But the appeal of a large and vibrant permanent outdoor venue soon drew, shall we say, less buttoned-up events. The Forest Hills Music Festival was a weekend precursor to New York’s many outdoor concert events today, bringing modern stars to the courtyards and giving this upper crust cloister a taste of counter-culture and teen-fueled rock and roll. One of its organizers was Ron Delsener, later to become a renown concert promoter in the New York area. Beginning in the late 1950s, concert events were staged on the court itself. At first, the venue drew acts like the Kingston Trio, Frank Sinatra, Harry Belafonte, Barbra Streisand, and even Woody Allen with a stand-up performance. But not of those performers brought the frenzy quite like the Beatles, who played two nights in late August 1964 and drew such passionate crowds that their helicopter had to land on the court itself, their fans separated from the performance area by an eight-foot fence. Forest Hills was known for its ungainly crowds. Bob Dylan performed there in August 1965 and was booed by audience members outraged that he would deign perform with electric accompaniment, “betraying the cause of folk music,” according to music historian Tony Glover. 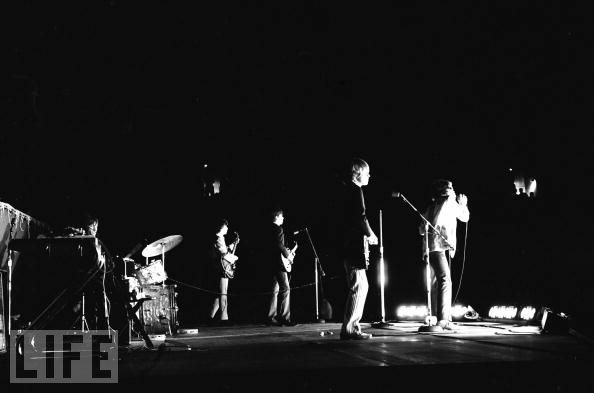 So with all that in mind, imagine the passionate crowds which awaited the shaggy ragamuffins from Dartford, the Rolling Stones, on July 2, 1966, appearing in the United States just as radio stations were buzzing with their number one song, ‘Paint It Black‘. 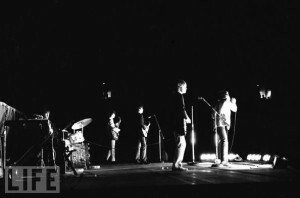 After three opening acts (including the Trade Winds), the Stones played ten songs at Forest Hills (pictured above), including ‘Lady Jane’, ‘Get Off My Cloud, and of course ‘Satisfaction’, to a crowd of 9,400 people.Yes, believe it or not, they didn’t sell out the venue, but that’s because the most expensive seats (an unheard-of $12.50!) went unsold, and the temperature for the outdoors concert was in the high 90s. And here’s some further context you should keep in mind. That was the summer of 1966. The biggest American musical artist that year was actually two young sons from Forest Hills, Queens — Paul Simon and Art Garfunkel — and their album The Sounds of Silence would become the biggest album of the year. Believe it or not, the tennis club lost its bid recently to become a New York landmark. **There seems to be a little confusion here. Keith Richards bios recall Cafe Wha?, while the diary of Bill Wyman mentions Ondine’s. Hendrix played at both venues a few times, so either (or even both) is possible. Keep in mind, everybody was probably stoned.